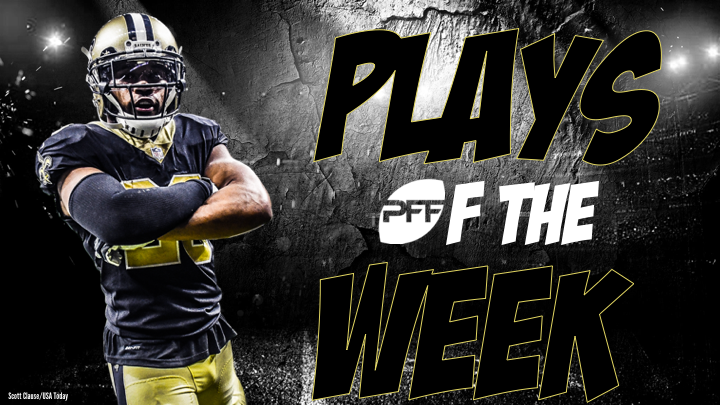 Welcome to the Plays of the Week for Week 19 of the 2018 season. Like every week, our team of analysts has dissected and graded every snap of every game to bring you the most detailed and valid analysis you can find anywhere. Below are the plays that earned our highest grades this week – who do you think produced the best play of the Divisional Round? By this point the game was all but over, but once again the Chiefs defense and Dee Ford stepped up to make it miserable for the Colts offense. They recovered the fumble, but right tackle Braden Smith was forced back towards Andrew Luck from the snap, knocking the ball loose in the process. The Chiefs defense stepped up when it mattered most in their win over the Colts, and this play is a good example of how they got it done. With the Colts in plus territory facing third-and-six, Justin Houston beat the right guard to bring down Andrew Luck for the key sack. Darius Leonard had an impressive rookie season and gave the Colts a lifeline late in the third quarter with this play. Not content with tackling Sammy Watkins on the jet sweep, Leonard ripped the ball loose and recovered the fumble for himself. Another dominant defensive play by the Chiefs defense, with Derrick Nnadi beating right guard Mark Glowinski deep in the backfield to record the tackle for a huge loss. It wasn’t a great night for the Cowboys’ quarterback, but this was arguably his best play of the night. Keeping the play alive with his feet, he delivered the ball downfield for Michael Gallup, who adjusted perfectly for the key grab. The Saints have used Taysom Hill in a way that few other players in the NFL have ever been used. He can throw and run coming in as a wildcat quarterback, he can throw and run on fake punts, and he can play special teams. Here he gave the Saints the lead with a throw down the middle to running back Alvin Kamara, who had gotten the better of Malcolm Jenkins downfield. The play was ultimately called back because of a holding penalty, but it was a terrific throw nonetheless. The Saints were in trouble early in the second quarter, down 14-0 with the Eagles almost at midfield. Up stepped Marshon Lattimore to take advantage of the throw by Nick Foles, securing the interception and slowing down the Eagles after their fast start.